The subject of the half built bridges at Rafal Rubí and l’Argentina, on the section of the main road between Mahon and Alaior, reappears periodically as a reminder of the conflict which was generated during the last government term of office and has made a return during the last few days. In GOB’s opinion, the situation of paralysis which we see from the outside is based neither on the technical aspects nor on the will of the politicians. Sometimes it is necessary to understand things by going back to the start. 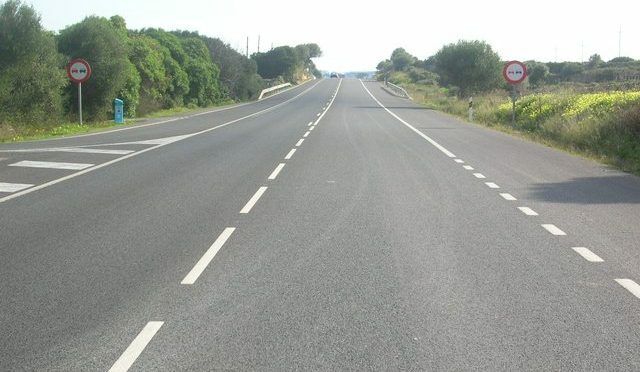 This conflict began in 2011, when the government team that won the local elections at that time put out to tender a competition to decide how the section of the road between Mahon and Alaior should be designed. But there were tensions within the governing party, which included supporters for making the main road into a dual carriageway. So, it was for political reasons, that a project was chosen that meant having to make substantial changes to the technical criteria. As a result, in October 2012 the Ministry of Transport made public a design which incorporated four double level structures at Biniai, Rafal Rubí, l’Argentina and Alaior. The disputes on the road then began. In order to be able to incorporate the four megastructures, the same technicians who had been selected for the best project with everything at one level, issued technical reports justifying a substantial change. This is the principal obstacle to taking back the half built bridges of Rafal Rubí and l’Argentina. The technicians, who justified such a drastic change, cannot now reverse their report. It is, therefore, an administrative problem. Therefore, it is not correct to state that the bridges have to remain for technical reasons. The portion of the road that has been completed between Ferreries and Ciutadella had double level structures planned for it (in front of the castle, by the quarries and at Es Tudons) but these have been eliminated and other solutions found without facing any technical objections. There are alternative solutions which are perfectly legal. In other words: there is no technical problem. So, now we are not confronting a political problem. The three parties that are currently in government are against the bridges between Mahon and Alaior and have agreed formally in a Plenary session to this end. No lack of willingness was detected, only an administrative inability. The raising of a two level structure near the Naveta des Tudons would have overwhelmed the landscape of the most visited monument of Menorca. This could be avoided as there were alternatives causing less impact. It would be a shame not to be able to avoid the devastating impact already created adjacent to the naveta of Rafal Rubi. It would be a shame because there are safe and legal alternatives that would allow the road to be modernised without generating this negative effect. It would also be a shame not to be able to redesign the construction of l’Argentina, where the Commission of the Environment has already recommended its demolition and the solution of building at ground level. Alternatives exist for building at ground level that cannot claim technical criteria. Let us avoid returning to an administrative labyrinth. What is failing in the Consell Insular is the capacity to resolve the administrative processing of a problem that has technical solutions and political will. It is this situation which translates to the public as not being governed by the appropriate people. Some people stage their protest more visibly than others, and there can be few people who were motivated to protest during the last mandate finding any satisfaction in seeing that this subject has not been cleared up.